Good farmers farm crops, great farmers farm the soil. Important to having great soil is building an active and diverse microbiome that will structure the soil and move and process nutrients in ways most beneficial to plants. The more microbes there are in a soil, the more fertile that soil becomes. In this series, we discuss the many important roles that soil microorganisms play in producing fertile soil and healthy crops. Walk out into a field and pick up a handful of soil. You might be excused for thinking that you just have a handful of very small rocks. But look at it closely: if you dug deep for that handful, you might see a few small insects and perhaps an earthworm or two. If the soil is rich, you’ll also notice that some of those “small rocks” are actually bits of decomposing organic matter (from dead plants or animals). Now let’s pull out a microscope, dial up the zoom, and take an even closer look. What you’ll see might astound you: healthy soil is teeming with masses of tiny, active creatures (microorganisms, or microbes) that perform the essential work of making soil a suitable growth medium for plants. When we say “teeming” we’re not exaggerating. 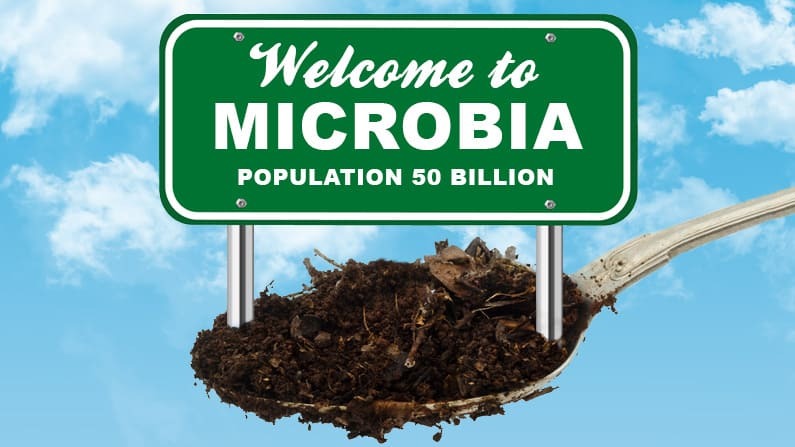 A teaspoon of soil can contain upwards of 50 billion microbes (for comparison, there are about 7.3 billion humans on our entire planet). They range from single-celled organisms to complex structures with specialized body parts. There are thousands of species of bacteria, hundreds of species of fungi and protozoa, dozens of species of nematodes, plus an assortment of yeasts, algae, and others: each has a job to do, an interconnected role to play. Plant surfaces, roots, and rhizospheres (the region of soil around the roots) are also teeming with microorganisms. Some of these are harmful, interfering with plant growth and reducing crop yields. But the vast majority of microorganisms are beneficial, essential for creating the soil components necessary for successful plant growth. Breaking down plant and animal matter into humus and releasing minerals in soluble forms that are easier for plants to absorb. Bringing nutrients into the soil from the atmosphere (nitrogen fixation) and from locked up mineral reserves that are already in the soil. Protecting plant roots from pathogens and parasites. Holding soil aggregates together while increasing porosity, creating channels through which roots can grow and water can flow—increasing infiltration and reducing runoff. Enhancing nutrient transport, drought tolerance, and resistance to disease and other stressors. Creating conditions that improve seed germination, transplant survival, and root growth. Because of the notoriety created by those relatively few harmful microorganisms, there is too often a tendency to overlook the existence of beneficial microorganisms or, even worse, fumigate the entire lot in an effort to get rid of the bad ones. As we discussed previously, however, soil needs a healthy diversity of microorganisms to produce the conditions needed for strong plants and high yields. Approaches to protecting beneficial microorganisms can include implementing balanced approaches to pest control, keeping soil well-drained and as salt-free as possible, engaging in practices that build soil organic matter (reduced tillage and regular additions of organic matter), rotating crops in a manner designed to provide diverse organic matter to the soil, and providing ground covers that reduce soil exposure to sunlight. We’ll also add—since we’re in that business—that it is important to provide nutrient supplements that contain carbon in order to keep the microorganisms well fed and active. It is particularly important to do this after applying high levels of pesticides or pesticides designed to kill off particular microbial species: those treatments will often reduce or impair the beneficial microorganism populations as well as the harmful ones. It is important to create an environment that promotes beneficial microbes so that they can get back to doing their essential work. An entire world exists in that handful of soil, and the tiny beings within it hold the key to successful crop production. As we steward our fields for sustainable crop production, we must make sure to consider the effect our practices are having on those essential microorganisms—the living engine of soil. For additional information about microorganisms and soil biology, read the Soil Biology Primer developed by the United States Department of Agriculture Natural Resources Conservation Service.